Trinity Church reflected in the John Hancock tower in Copley Square. So classic! 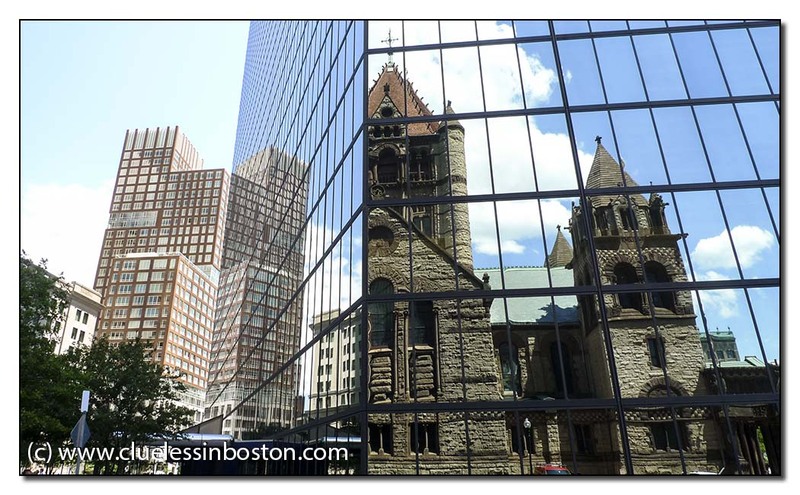 Within the past year, I saw a post from a European blogger now living in greater Boston, who called Trinity Church an old and ugly church next to the wonderful Hancock Building. It made me wonder if I love Trinity Church just because I have seen it since I was little. Perfect. One of my favorite places in Boston. Thanks for the comments on my blog - I'm going to try your suggestion of converting my photo to B&W to see how it looks! This is a perfect, crisp, clear reflection of Trinity church and the pretty summer sky. Great capture!! The sky is wonderful indeed and you got perfect reflections in this picture, amazing image! Absolutely Fabulous! Very strong reflection, And I like the contrast old-new, of course! You should link this to Week-end Reflections. Beautiful shot! Happy sky watching. Wow! This is a beautiful shot. This would make one heck of a jigsaw puzzle, I bet. LOVE this one: old and new together at last. Smiles! My post today for Skywatch Friday is also the sky reflected in a building. I love this part of Boston and don't know why anyone would say it was an ugly church. I just popped over to Shirley's post based on her comment above. I also try to empty my camera at least weekly and make sure they are also backed up, that drives my husband nuts, he thinks I'm a fanatic for backing up but having once lost a hard drive, I learned the hard way. What a great reflection photo! I love the reflected sky, and that wonderful contrast of the historic and weathered reflected in the modern and shiny. (Though give me the character and classic beauty of the historic buildings any day!) I love Birdman's idea about this making a great jigsaw puzzle! It really would! I miss Boston - my favorite city since I lived in New England as a teen and young adult, it will always hold a special place in my heart. Thanks for sharing it with us! Brilliant reflections, old in new is such a great image, here you have both old in new and new in new, nice!! Wow! You have done an incredible job with this photo. Makes me want to be in Boston so that I can figure out more about the building to the left. Right now I'm dreaming of a stroll in front of the library loooking over at Trinity as I'm on my way to Au Bon Pain.